One is connect with phone by bluetooth,It Enable To Make Call Or Receive Call/Send/Get Message Etc Via Bluetooth. Another one is Network Mode (need Insert SIM TF Card),It Enable To Make Call And Send Or Get Message Via The SIM Card You Inserted,the watch be a cell phone. It just support daily life waterproof,such as wash hand.can't wear to swimming,diving or take a shower. Work as a smartphone companion,also as a phone after inserting 2G SIM card,support TF Card. Compatible with Andriod smartphone& Android Tablet PC. (4.2 and Above) Include SAMSUNG galaxy s4/s5/s6/s7 Edge Note 3/4/5 HTC NEXUS SONY LG HUAWEI XIAOMI ect. Built in 550mAh polymer battery,charger time about 1 hour,could support 3-hour phone call,6-hour music play,stand by one week. 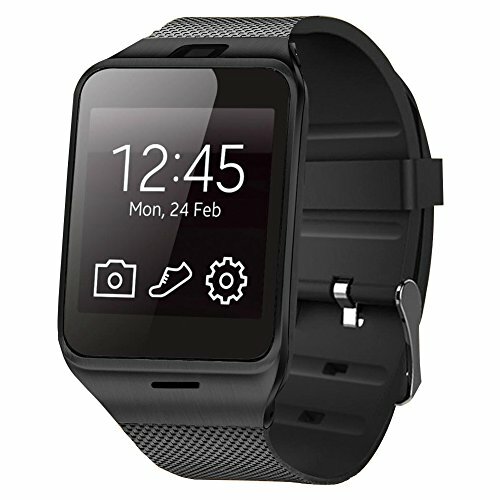 Call / SMS Reminder:supports 2G SIM card,can realize basic call and SMS function,if you want to use Whatsapp,Twitter,Facebook on watch,you need put a 2G SIM card or connect the watch with your phone. Support hands-free calls /Answer or Dial calls from your wrist,Remote control your phone camera to taking a photo,health tracking app can monitor your sleeping,walking. Multi Function-Pedometer/Sleep monitoring/Call reminder//Remote Camera/Intelligent anti-theft anti lost/Sound Recording/Sedentary remind/Music player/Mobile phone contact sync/message notification,enjoying your life. Compatible with Andriod smartphone& Android Tablet PC. (4.2 and Above) .Bluetooth 3.0,include SAMSUNG galaxy s4/s5/s6/s7 Edge Note 3/4/5 HTC NEXUS SONY LG HUAWEI XIAOMI ect.